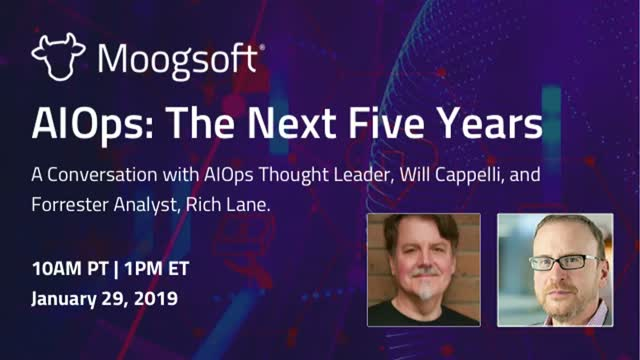 You’re invited to join our complimentary webcast, AIOps The Next Five Years, featuring Forrester analyst Rich Lane and Moogsoft CTO Will Cappelli. AIOps is becoming imperative to the management of today’s complex IT systems and their ability to support changing business conditions. In this webinar, the speakers will discuss the role that AIOps can and will play in the enterprise of the future, how the scope of AIOps platforms will expand, and what new functionality may be deployed. This webcast will include a Q&A with our guest speakers. The explosion in the volume of operational data requires a new approach to IT Operations, enabled by new machine-learning capabilities: AIOps — Artificial Intelligence for IT Operations. Algorithmic analysis of events and alerts can help IT professionals from different teams and backgrounds to swarm together in virtual teams, specific to each particular incident. By collaborating and sharing information and insights, these virtual teams can solve issues and problems much faster than traditional “waterfall” sequential processes can. These new processes help organizations ensure continuous assurance of their critical business services. Watch this webinar to learn how ITSM can be extended beyond simple ticketing to cover new collaborative ways of working with AIOps. Integration of human expertise and AI-powered automation is the new reality in the network management center. Changes to processes and models are required to support the complexity and accelerating rate of change of modern IT infrastructures. As ongoing digital transformation drives increasing expectations of IT performance, a new multi-vendor IT Operations toolchain is emerging. Join Mike McGibbney from SuccessFactors as he describes the transformation of a service delivery operations organization struggling with the demands of rapid growth into a world class, next-generation services organization capable of supporting the enterprise cloud experience. Centering his strategy around four key promises — Availability, Speed, Transparency and Maturity — Mike will highlight SDO’s priority to ensure a highly reliable and available cloud environment to create a better experience for customers. He’ll talk about SDO’s plan to significantly elevate the organization’s ability to deliver a better cloud experience, and how Moogsoft became a partner in helping SAP SuccessFactors build a better cloud for better business. The modern Cloud delivers faster time to market, lower IT costs, and greater overall value to the enterprise by allowing companies to focus more on the core business problems rather than the infrastructure used to solve them. But the path to the cloud can be challenging for anyone with an established presence on-premises, or in a private data center. Dan Taylor from Microsoft’s Cloud & Enterprise division shares with you how large enterprises are tackling this problem and gaining immediate value by leveraging the cloud. You’ll hear how enterprises are managing their migration to the cloud by embracing hybrid patterns, containerizing and migrating applications, using single-pane-of-glass monitoring solutions, and leveraging Azure to tackle data privacy. IT Ops and DevOps for the modern enterprise offers many benefits — increased agility and productivity, leaner operations, and hybridized hosting options — but digital transformation isn’t easy, especially if you’re not asking the right questions, addressing the right issues. Dive into the “new normal” for enterprise Modern Ops with this informative Moogsoft / xMatters webinar event, and find out the 5 questions that every CIO needs to ask in 2018. Throughout rapid expansion, globalization and going public, GoDaddy was challenged to scale operational and incident response framework in new ways. In this detailed talk, join Tom Duran, Site Reliability Manager at GoDaddy, as he takes you through the transformation from a largely manual incident process to a fully automated lights-out incident response model. Despite decades of R&D dedicated to Root Cause Analysis — and counter to the claims of numerous technology vendors who claim to offer it — the traditional approach to RCA and concepts behind it have been flawed. Leading analysts like Gartner agree that Root Cause Analysis is still a people-dependent process. Furthermore, they recommend that ITOps leaders leverage machine learning technology to provide contextualized information across the production stack, understand similarity in events from the past, and accommodate human interaction so that the algorithms can learn from human behavior over time. Moogsoft’s unique Probable Root Cause is the first technique that can understand causality in unpredictable IT environments with a significant degree of certainty, and without reliance on a model. In this webinar recording, Moogsoft executives Richard Whitehead and Robert Harper discuss this innovative approach to Root Cause Analysis, and how it can change the way your operations teams address IT incidents. the closing session of Moogsoft’s 2017 AIOps Symposium brought together some of the sharpest minds in the IT Operations space for an intimate discussion about the issues facing enterprise ITOps and DevOps. •And the evolution of the ITIL Service Desk over the next five years, especially given today’s world of continuous-integration and DevOps.